Jyo-Sejime Urushi for base coat (Shitaji) mixing with "Tonoko" polishing powder, which make a harder coating surface on wood, or glue such as string contact of fishing rods. Color is transparent, changed to yellow brown after dried. 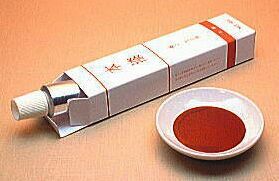 Urushi is made of tap of Urushi tree, which belongs to family of sumac tree, and used over 6,000 years in Japan. Uncured lacquer might cause an typical Urushi allergic reaction, which mostly disappear in a few days, but some cases take much longer, depends on individual immune nature. This Sumac tree rash (eruption of skin) is not responsible for the consequences.